Adrenalectomy has historically been a significantly morbid procedure due to the deep location of the adrenal glands in the retroperitoneum. Laparoscopy has significantly decreased the morbidity associated with this operation, and laparoscopic adrenalec-tomy is now the recommended gold standard for the majority of adrenal disorders requiring surgery. Despite this transition to minimally invasive surgery, the incidence of disease processes requiring laparoscopic adrenalectomy is quite low and can potentially limit acquisition of skills necessary to perform the procedure. Laparoscopic adrenalectomy requires a delicate dissection of the adrenal gland as well as the adrenal veins and arteries. Given the somewhat restricted location of the adrenal gland and the careful dissection needed for successful removal, techniques of robot-assisted laparoscopic adrenalectomy have been reported in experimental models and clinically. Gill et al. demonstrated the feasibility of robotic adrenalectomy using the porcine model in 2000 (10). Using the Zeus robotic system, the Cleveland Clinic group successfully performed four robotic adrenalectomies. During one robotic adrenalectomy, an injury to the inferior vena cava required telerobotic suturing with 5-0 prolene suture. None of the remaining procedures were associated with complications, but the operative time for robotic adrenalectomy was roughly double the time required to perform the conventional laparoscopic procedure. In another experimental study comparing the Zeus robotic system to the da Vinci robotic system, Sung and Gill reported that robotic adrenalectomy was more intuitive with the da Vinci system, and that operative times using this system were significantly shorter than those reported with the Zeus robotic system (5). The first clinical use of the da Vinci robotic system for robotic adrenalectomy was reported by Kim et al. in August, 2000 (11). Shortly thereafter, the first bilateral da Vinci-assisted adrenalectomy was reported in a human by Horgan and Vanuno (12). They reported their overall experience using the da Vinci system in 34 patients including the one patient in whom successful bilateral adrenalectomies were performed (12). Others have since reported their experience in performing robot-assisted adrenalectomy, yet overall available clinical data is limited (13,14). Given the limited clinical experience with robotic adrenalectomy, specific indications have not been clearly defined. It would be anticipated, however, that the indications for robotic adrenalectomy would be the same as the current indications for traditional laparoscopic adrenalectomy. 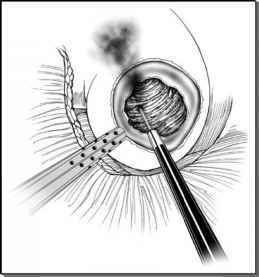 Currently, robotic adrenalectomy has been limited to tumors <6 cm in diameter. The specific indications for the reported cases have included pheochromocy-toma, active and inactive adenomas, and adrenal metastasis. The technique of robotic adrenalectomy has been performed through a four or five port transperitoneal approach with the patient placed in a 45° lateral decubitus position. Port placement and the operative steps of robotic adrenalectomy are very similar to those performed for conventional laparoscopic adrenalectomy. Bentas et al. reported one of the initial clinical experiences with da Vinci-assisted adrenalectomy in 2002 (13). Among the series of four patients undergoing robotic adrenalectomy, the mean tumor size was 3.8 cm, blood loss was minimal, and operative time ranged from 160 to 330 minutes. No intraoperative complication or open conversions were reported (13). Desai et al. also reported their experience with two patients and again noted minimal blood loss during the da Vinci-assisted procedures (14). However, they did report an adrenal capsular tear secondary to lack of tactile feedback with the da Vinci robot system and concluded that this was a technical disadvantage of the robotic technique when compared to the conventional laparoscopic or open adrenalectomy technique. Perhaps the largest series to date on robotic adrenalectomy was published by Brunaud et al. (15). This prospective randomized study compared da Vinci unilateral adrenalectomy with the standard laparoscopic procedure. Fourteen patients were enrolled in each arm of the study for a total of 28 unilateral adrenalectomies. Mean operative time was longer with the da Vinci system (111 minutes vs. 83 minutes). Interestingly, operative time required for conventional laparoscopic procedures correlated with body mass index, whereas operative time required for robotic adrenalectomy did not correlate with body mass index. Additionally, operating time with the da Vinci system decreased later in the study as the surgeon's experience with the procedure increased. There were no significant differences between the two procedures with regards to open conversion rate (7% for both), morbidity, or duration of hospitalization (6.8 days) (15). Despite early reports showing feasibility of robotic adrenalectomy, further study is needed with greater patient enrollment to assess the true benefit of robotic versus laparoscopic adrenalectomy and specific indications for the robotic procedure.